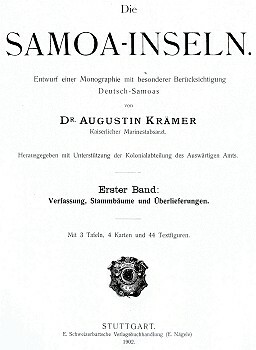 Dr. Augustine Kraemer : Die Samoa-Inseln, 1902. Entwurf einer Monographie mit besonderer Berucksichtigung Deutsch-Samoas. E. Schweizerbart Verlagsbuchhandlung (E. Nagele), Stuttgart, 1902. Two volumes. Unfortunately the text of Die Samoa-Inseln is in German, which I am unable to read. 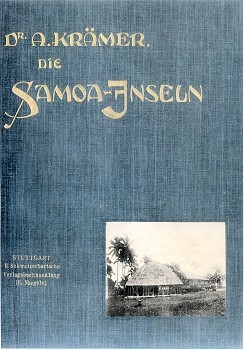 The title translates as The Samoa Islands - Draft monograph with special reference to German-Samoa. No. 43 Das Wellenengleitspiel (Fa'ase'e). The German roughly translates as "wave play", the term in parentheses presumsably the Samoa name. The image shows a large number of participants, some of whom have short body boards. "Augustin Kraemer or Krämer (1865–1941) was a German naturalist and ethnographer. Augustin Kraemer was a ships doctor who worked in the Polynesia in 1893–95 and 1897–99. He wrote the Palau sections of Georg Thilenius five-volume ethnographic documentation of the Hamburg Südsee Expedition, which sailed through Micronesia to record the island peoples and their way of life during the early 1900s (Palau, Ergebnissse der Südsee-Expedition, herausgegeben von Dr G. Thilenius 1926, Hamburg). His second voyage is described in Hawaii, Ostmikronesien und Samoa. Meine zweite Südseereise (1897–1899) zum Studium der Atolle und ihrer Bewohner published in Stuttgart by Strecker & Schröder, 1906." No. 43 Das Wellenengleitspiel (Fa'ase'e) - cropped. Geoff Cater (2010-2012) : Dr. Augustine Kraemer : Die Samoa Inseln, 1902. Common to east and west. Of seven games tabulated by Linton (19, p. 453), the surfboard and dart throwing are given as common to both areas. Though dart throwing is given merely as present in Samoa and important in some of the eastern localities, the association of the game in Samoa with historical events and oft quoted sayings used by orators shows that it was equally important in the west. The use of the throwing cord with forms of dart throwing has been remarked. Between 1925 and 1927, Linton undertook an extensive collecting trip to Madagascar for the field museum, exploring the western end of the Austronesian diaspora after having studied the eastern end of this culture in the Marquesas. He did his own fieldwork there as well, and the book that resulted, The Tanala: A Hill Tribe of Madagascar (1933), was the most detailed ethnography he would publish. Publisher: Wellington, N.Z., Lyon and Blair, 1891.